Shot on dusty, sun-blasted locations in and around Taylor, Texas, The Hot Spot has a distinct retro feel yet takes place in the present. The screenplay was adapted from Charles Williams’ 1952 novel “Hell Hath No Fury,” and originally developed for the screen as a Robert Mitchum vehicle in the early 1960s. This is mind, Hopper wanted a director of photography who could use light to invoke layers of emotional texture. He chose newcomer Ueli Steiger. Steiger got the job, much to his surprise. Steiger would again collaborate with Hopper on the 1994 comedy Chasers. Steiger would later collaborate with Hoffman on the features Some Girls and Soapdish. After moving to Los Angeles, Steiger photographed such features as Singles, Now and Then, House Arrest, Austin Powers: The Spy Who Shagged Me, Bowfinger, Rock Star, The Maiden Heist and the upcoming Second Act. He also became a frequent collaborator with director Roland Emmerich, on Godzilla, The Day After Tomorrow and 10,000 BC. Steiger has been a member of the ASC since 2000. 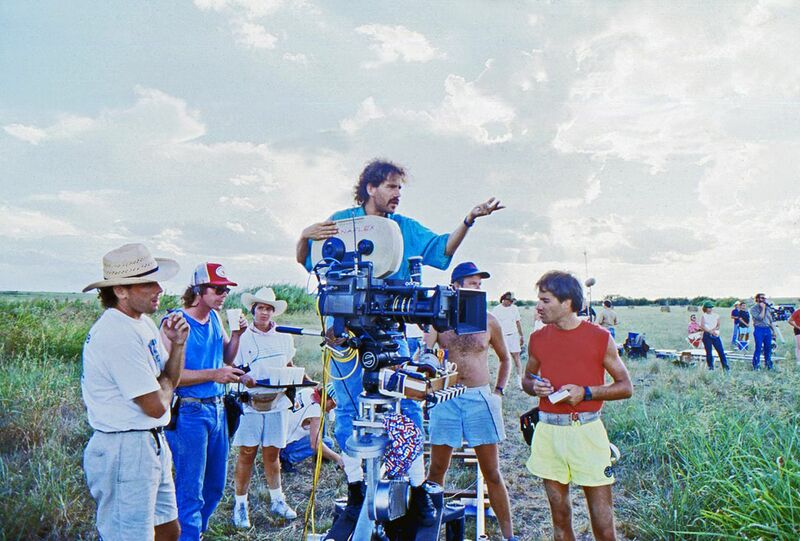 Steiger on location in Texas during the production of the film.